Every Wednesday from 1:30 – 2:30 we are conducting supervised sessions for kid’s to learn the basics of working with clay. Minimum age is 5. These drop-in sessions are $5. After 2 sessions, they are free to LAC members. Family memberships are only $60 / year and include a total of 4 family members. Additional members can be added for $15 each. These are arts and crafts sessions for Mommies (Parents or Guardians) with toddlers and pre Kindergarteners (approx. ages 1.5 to 4 yrs). Parent and child will explore a variety of art materials and mediums. This creative experience allows child and parent to work on manipulative skills, communication, relationship bonding, foundations in art and creative expression. The process and experience is more important than the end product. Current cost is $5.00 per session. Parent/child do not have to attend consecutive weeks and may choose any Monday to attend when classes are in session. Child must come with an adult. Enroll now at the Lanai Art Center Gallery or at any Monday class. Class size is limited by space available. We offer Basic Introduction to Working with Clay to those interested in using our ceramics facility. 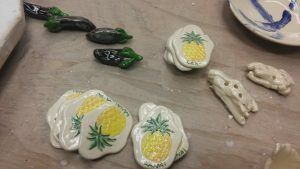 The introductory session will give participants a tour of the ceramics studio, knowledge about the tools and equipment, standard ceramics terminology, and a lesson in the basics of working with clay. The session typically runs 1.5 – 2 hours and is limited to 1 – 6 participants 16+ years of age. Price includes clay and glazes for one small project. After completing the class all participants will receive a ceramic studio pass card. This card must be presented in order to use the ceramics studio outside of class times. Recommended for beginning to intermediate participants. Sessions start at 3 PM and take place on the last Thursday of every month (as long as someone signs up). Special times and private classes may be arranged. Please leave your name and a contact number with the gallery and an instructor will contact you. The introductory session is $30 for members, and $40 for non-members. However, the studio access card is only available to members. Non-members who have completed the session may sign-up for a membership and receive their card. Members who wish to receive further instruction may do so by signing up for the advanced session. 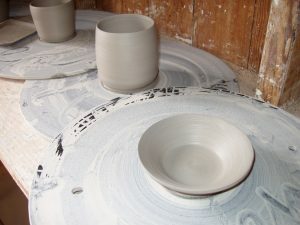 The advanced session will give participants a chance to try different techniques. 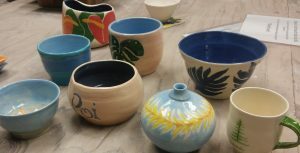 It is expected that participants in the advanced session know their way around a ceramics studio and be familiar with the various terms and tools used. Price includes clay and glazes for one project. Recommended for intermediate to advanced participants. Sessions start at 3 PM and take place on the last Wednesday of every month (as long as someone signs up). Learning session are typically 2 – 3 hours and are limited to 1 – 3 participants 16+ years of age. Special times and private classes may be arranged. Please leave your name and a contact number with the gallery and an instructor will contact you. The advanced session is $40 for members, and $50 for non-members. LAC members who do not have a studio access card may receive one after completing the session. Non-members may sign up for membership after the session to receive their card. Arts and crafts sessions for Mommies (Parents or Guardians) with toddlers and pre Kindergarteners (approx. ages 1.5 to 4 yrs). Parent and child will explore a variety of art materials and mediums. This creative experience allows child and parent to work on manipulative skills, communication, relationship bonding, foundations in art and creative expression. The process and experience is more important than the end product. Drop in supervised learning sessions for kids. Learn the basics in working with clay while creating cool stuff. $5 per session. Free to members AFTER attending 2 sessions. Learn new and / or advanced techniques on the last Wed of each month (or by special arrangement). Pre-registration required. Introduction to our ceramics studio and working with clay on the last Thursday of each month, or by special arrangement. Pre-registration is required!